Yet another brand of cheese has fallen victim to an ongoing listeria contamination: Guggisberg Cheese has recalled a dozen types of Colby type cheese products. The recent listeria contamination of certain cheese from Deutsch Kase Haus has spread to include Guggisberg deli products that may have come into contact with the tainted products. Guggisberg said in a notice provided to the Food and Drug Administration that it was recalling the products “out of an abundance of caution and with an emphasis on its customers’ wellness and safety.” The company has recalled a number of products manufactured by Deutsch Kase Haus under the Guggisberg label. 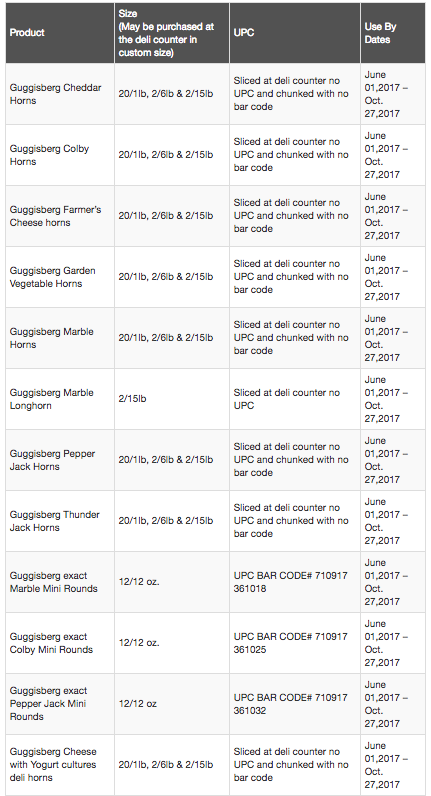 Guggisberg notes that the products were manufactured between Sept. 1, 2016 and Jan. 27, and sold primarily in retail stores at deli counters and deli cases located in Ohio, Indiana, Michigan, Pennsylvania, Kentucky, Illinois, and West Virginia. Consumers who have purchased the recalled products are urged to return them to the place of purchase for a full refund or they may discard the product. The ongoing listeria contamination has already been connected to several recalls of Sargento, Taylor Farms, MDS Foods, Choice Foods, and Country Fresh products.